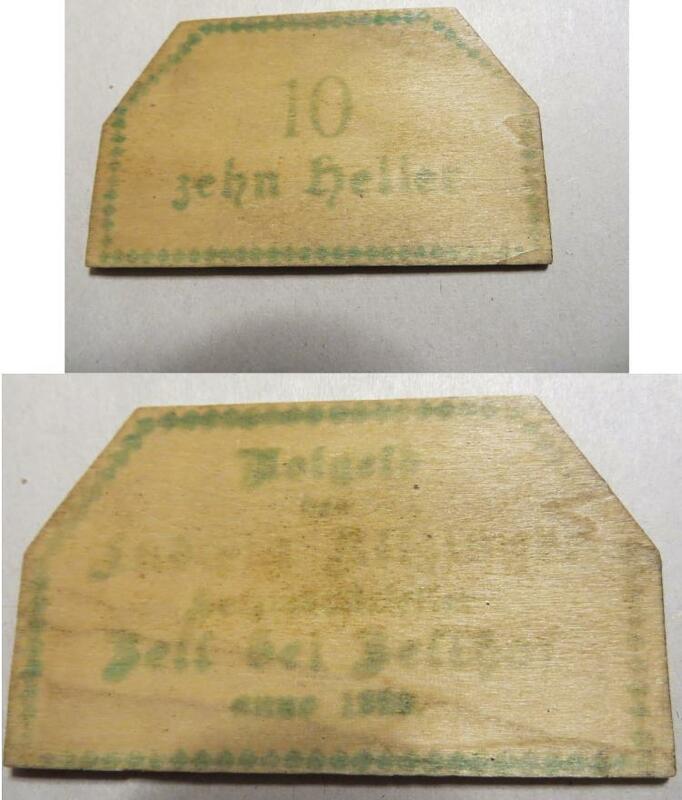 This 10 zehn heller , which I believe at the top on the reverse says "Notgeld" but it is really hard to make out. The date looks like "1827" but is probably 1923 and it seems to have a wood grain texture to it. Can anyone give me more information on this piece? The type of wood seems veneer. 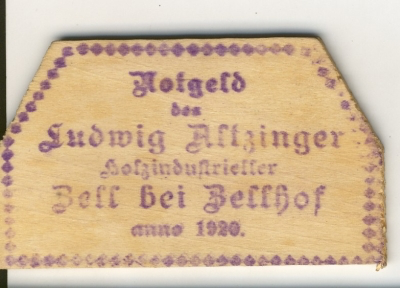 More general background for the financial and economic situation of and in Austria shortly after the war is at Notgeld 1918–1924. Heller is the 100th part of the official currency Krone during the Habsburg monarchy, backed by gold. 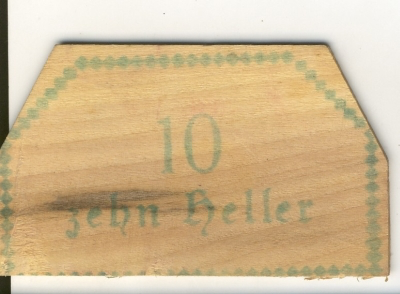 These pieces were issued locally by an 'industrialist in wood' (Holzindustrieller) who had an ample supply of wood in Zell (now Bad Zell). Inflation in Austria began much earlier than in Germany. In Austria the value of the Krone went down from the start of the war and inflation reached 1500% by the end of the war compared to 1914 (officially the German Mark just had a rate of 200% up to 1918). This type of money was in official circulation until October, 1st 1921, but lost any real world value before that date. Not the answer you're looking for? Browse other questions tagged economy money austria or ask your own question. What historical situation is comparable to what Europe is currently facing? Why did Britain decide to issue perpetual bonds during Napoleonic era? What were the largest European Treasuries, in gold and silver, at the end of the Seven Years War? How did Romans know if their money was debased? Did indentured servants in British North America have job security? Who was the first to point out that transmutation of gold would be mostly useless, since it would simply lead to inflation?